A deliciously easy Peanut Butter Chocolate Cake. 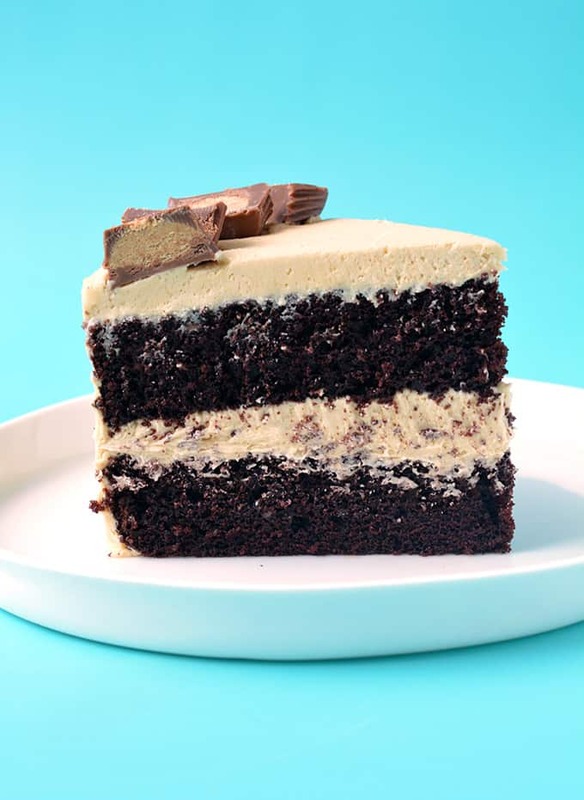 Two layers of soft, chocolate cake covered in creamy peanut butter frosting and topped with Reese’s Peanut Butter Cups. 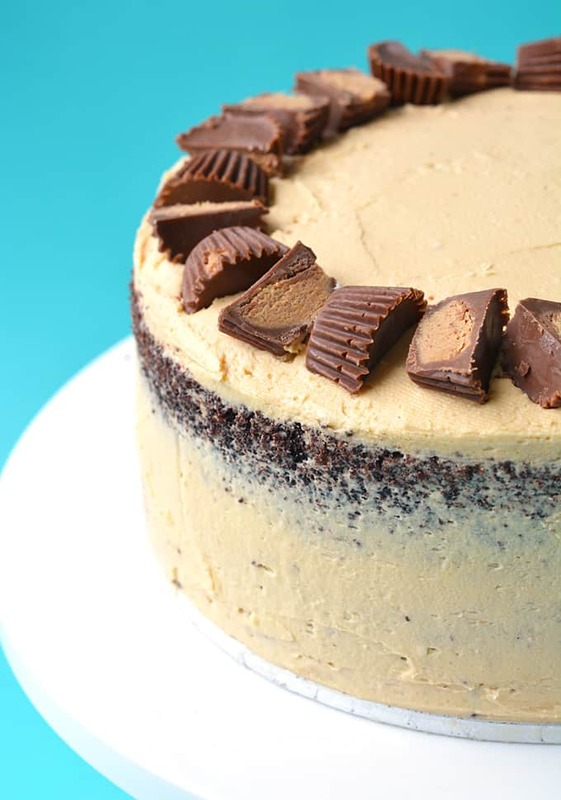 This gorgeous Peanut Butter Chocolate Cake consists of soft, cocoa-filled chocolate cakes, a generous slathering of creamy peanut butter buttercream and loads of Reese’s Peanut Butter Cups. 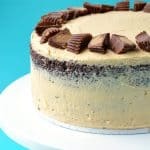 Altogether, it’s one over-the-top layer cake that’s dreamy, creamy and perfect for peanut butter lovers like you and me. This cake needs to come with a warning. One that says the making of this cake may cause a dirty kitchen, including cocoa-covered benches and a butter-laden floor. BUT it is all worth it. 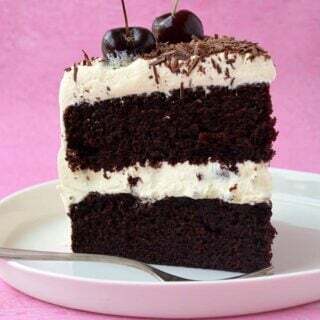 Layer cakes certainly do require more effort, but the results are extremely satisfying. And this pretty pb cake is sure to impress your family and friends. This cake is a total showstopper. Peanut butter and chocolate is an American favourite yes? I think it definitely deserves all the attention too. 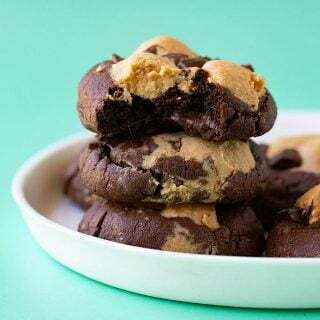 Whether it’s peanut butter brownies or peanut butter cookies, I can’t get enough PB in my life. And I promise you, this pb frosting is completely mouthwatering. Honestly, I could take a bowl of it and a spoon and simply go to town. It’s seriously buttery and smooth – it practically melts-in-your-mouth. I just adore the look of crumb coated cakes, so I purposely left it with the layers shining through. To achieve this look, you just need a cake scraper. Do you have one? The only way to make this cake ever better, was to finish it with a bundle of Reese’s Peanut Butter Cups. In fact, if I’m honest, this whole cake tastes like one giant peanut butter cup. And I am SO ok with that. If you’re looking for a gorgeous layer cake for your next birthday or celebration, this is YOUR cake. 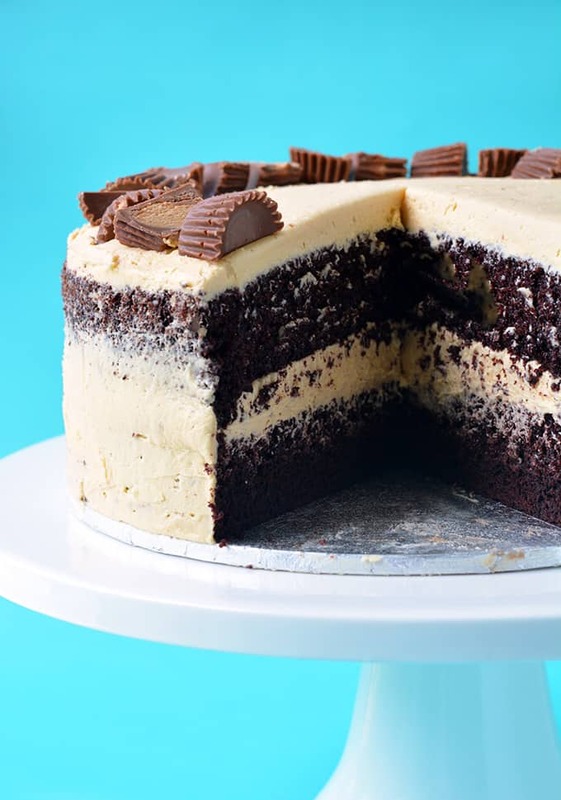 Two layers of chocolate cake covered in peanut butter frosting. Preheat your oven to 180 C (360 F). Grease and line two 8 inch round cake tins with baking or parchment paper. In a large mixing bowl, sift the flour, cocoa powder, baking powder and baking soda. Then add the sugars. Whisk together. In a separate mixing bowl, add the buttermilk, vegetable oil, vanilla and eggs. Whisk together. Boil the kettle and pour out 1 cup of hot water and set aside. Add the wet ingredients to the dry ingredients. Start to fold together, slowly pour in the hot water, and continue to mix until all the ingredients are incorporated. Divide the mixture into two cake tins and bake for approximately 30 minutes or until a skewer inserted comes out clean. Leave for 10 minutes before gently removing the cakes from their tins and leave them to cool completely on a wire rack. In a large mixing bowl, use an electric mixer to beat the butter and peanut butter on a medium speed until creamy and smooth. Sift in half the icing sugar. Add a tablespoon or two of milk to help loosen up the mixture. Add the rest of the icing sugar and continue to beat until creamy. Add a tablespoon of milk as needed. You want a thick and creamy frosting. If it’s too thick, add a touch more milk. Trim the tops of your cakes using a serrated knife, so they are nice and flat. Cover the first cake layer with a generous amount of frosting on top and spread it out, going right to the edges. Place the remaining chocolate cake layer upside down on top. Then gently frost the sides and top of the cake using a spatula. Use a cake scraper to gently remove extra frosting from the sides. Top with Peanut Butter Cups. This recipe was first published on Sweetest Menu in July 2015. I haven’t tried the cake yet, but as to the frosting….. I cooked up 1 cup almond milk with 5 tbsp flour (whisking like a crazy person to keep it smooth), let that cool COMPLETELY and then mixed it into this frosting recipe – OH MY WORD, what have I been missing!?!? Smoothest, fluffiest, perfect amount of sweetness frosting that might last long enough to go on my son’s birthday cake! ☺️ Haha, I can’t wait to try the cake recipe next. Need to find someone with a birthday in April! Hi Flor! So glad to hear you enjoyed the cake! ☺️ I use Bega peanut butter for the frosting, but most regular store bought peanut butters, like Jif or Skippy, should work. I just don’t recommend using a natural peanut butter that tends to separate or it may have that effect in your frosting. Hope that helps! This cake looks to die for! Yum! Aw thanks Lindsey! I agree with you on pb and chocolate, does it get any better? I am so impressed that this has JELLY in it too! You’re so sneaky, and I love it! I couldn’t resist! 😉 Thanks Lynn! This looks fantastically waistband expandingly brilliant! Beautiful!! I really need to brush up on my layer cake skills!! Thanks Melissa, layer cake are so much fun! YUM!!! 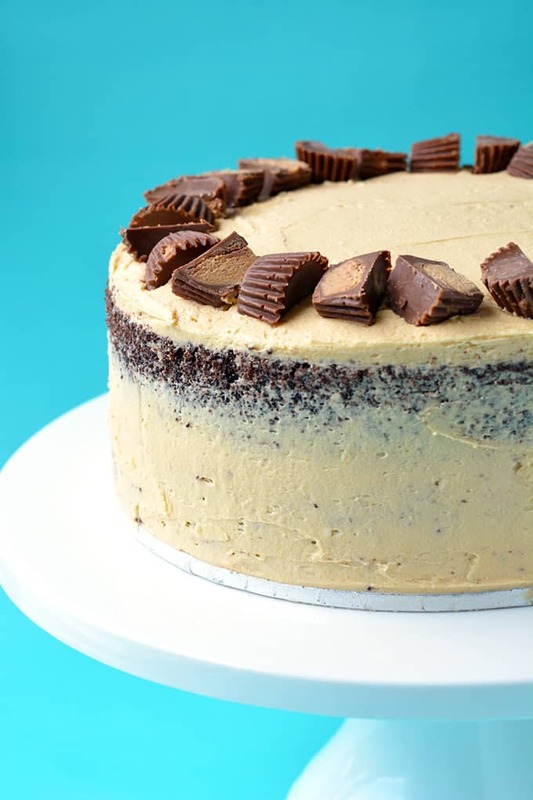 I just made some peanut butter buttercream yesterday and was licking if off the beaters, so I can imagine how delicious this cake would be! Thank you Kelly! I love chocolate and peanut butter too! Yes cake! Yes peanut butter! OMG did you say strawberry jam… I think I love you. 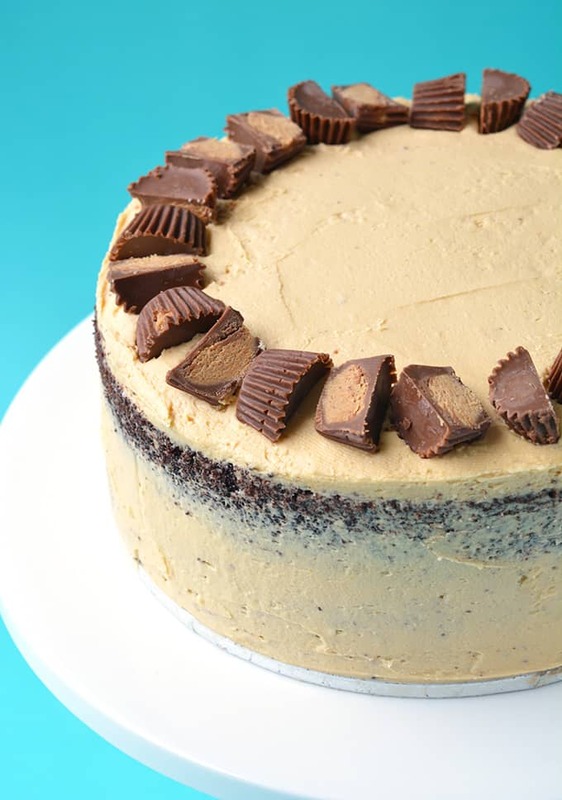 Seriously amazing — chocolate and peanut butter IS an epic combination! Pinned! This cake looks absolutely perfect! Those layers!!!! Amazing. 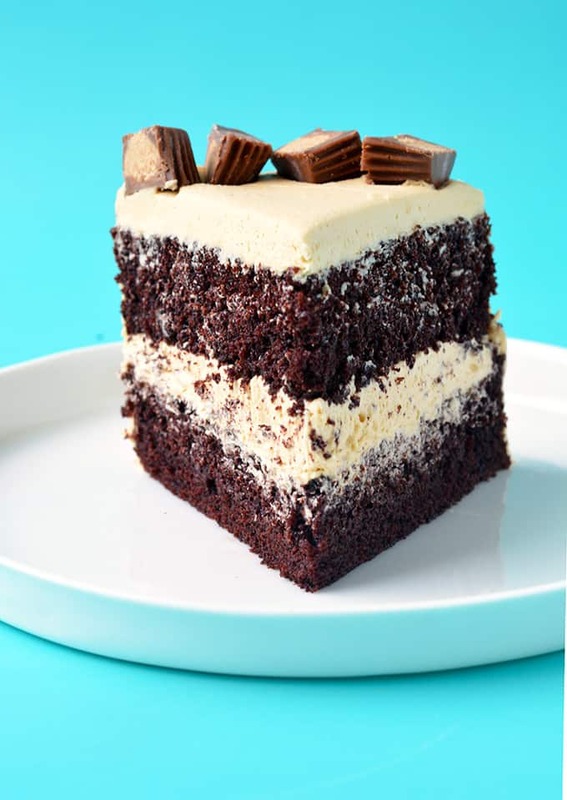 This looks sooooo delicious, I love peanut butter and chocolate – you’ve made me sooo hungry! I am raising my hand. I am a proud peanut lover! I love how you define this a showstopper, great one! Thanks for sharing, it looks indeed delizioso! Thank you Emanuele! Nice to meet a fellow peanut butter lover! 100 percent beautiful. I love the understated presentation, which allows each element to shine. 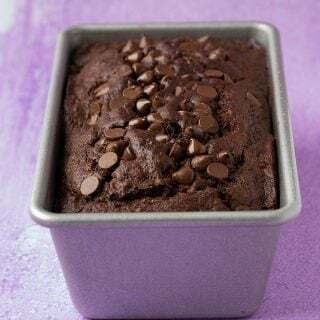 I especially love that it’s a buttermilk chocolate cake as the base – I would bet that tastes incredible with peanut butter. Oh, and your trixy addition of jam – love it! You MUST be kidding. This is incredible! Can I ask – when are you starting your bakery? 😉 Off to do some serious pinning! Peanut butter, jam, and chocolate! Oh yes please! 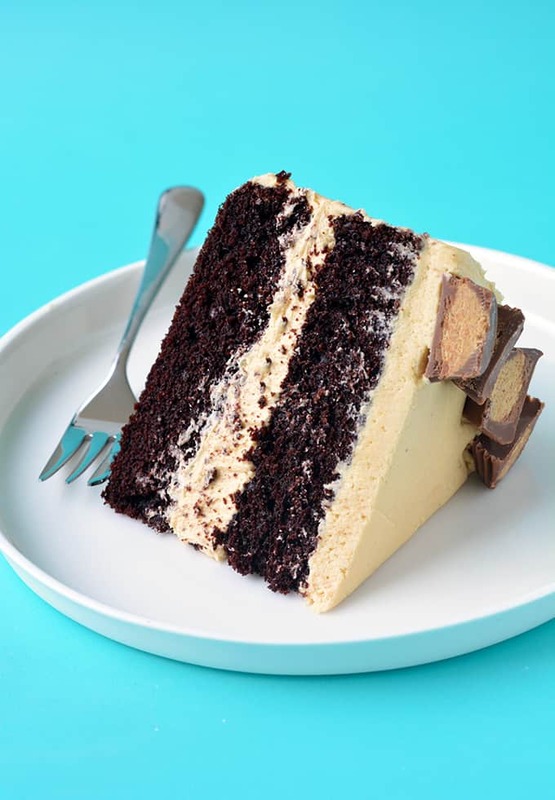 This cake is simply divine Jess – all of those chocolate cake layers with the extra sweetness of jam and sign me up for a bucket of that peanut butter frosting! Amy, thank you so much for your kind comment! 🙂 Crumb coated cakes are so pretty aren’t they! Pretty sure this cake is all I’m going to be thinking about all day now! YUM!